In Rome’s Testaccio district, the ex-garbage dump of the ancient Romans (literally, there’s a hill around the corner from here that we found while walking around to kill time before lunch that was made from broken Roman terracotta), where the tourists rarely venture, is a bowl of pasta that is the stuff of legends. It’s a dish that’s just now gaining momentum and becoming trendy (god help us), and it’s so simple it sounds downright boring, made with only three ingredients: pasta, cheese and pepper. Seriously – that’s it. Well, it’s not, there’s a real art to it, and Elizabeth will explain it to you better than I can if you want to take a quick detour to her blog. 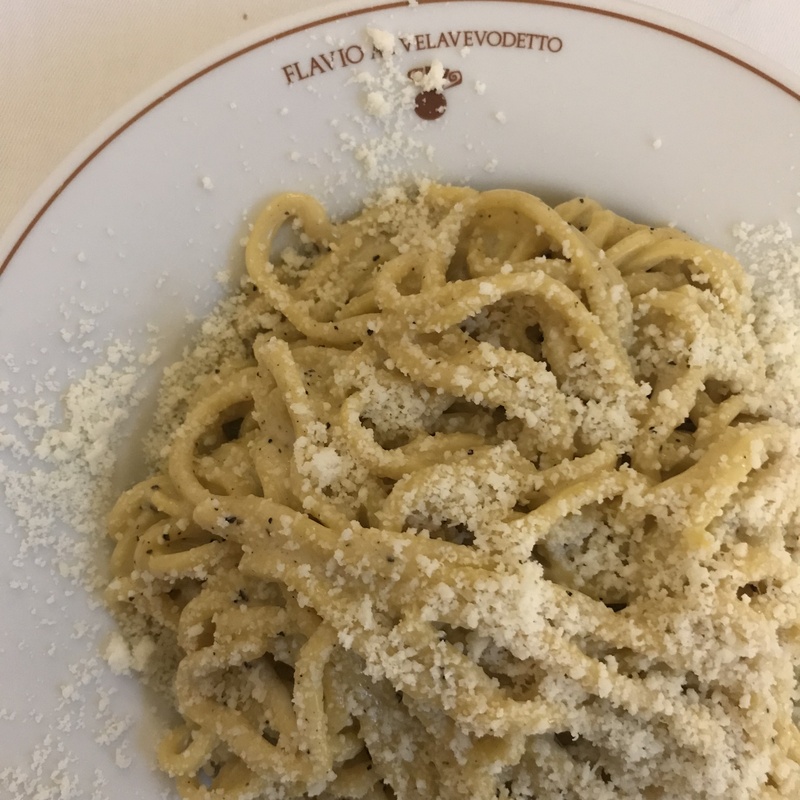 I knew we were eating cacio e pepe when we visited Rome, and there’s only one person I trusted to recommend the right place to eat it – and Elizabeth Minchilli didn’t let me down. Having seen a ridiculous number of bowls of this dish on her Instagram account in the year leading up to our trip, all from the same restaurant, it was decided we’d make the trip out to Testaccio to visit Flavio’s. The restaurant itself is one of those you’d-miss-it-if-you-weren’t-looking-for-it kind of places. No big flashy signs out the front, no neon lights in the shape of pasta bowls, just a little gated courtyard with the name clearly printed above it. We rolled in right on opening time, because we heard it got busy fast – it did. The place is surprisingly big inside, with several dining areas seperated by walls and corridors. The tables were laid with crisp white linen, and the staff gave the immediate impression of being a very well-oiled machine, to the point of being almost mechanical – I’m guessing the Roman regulars have a bit of a warmer welcome, though. 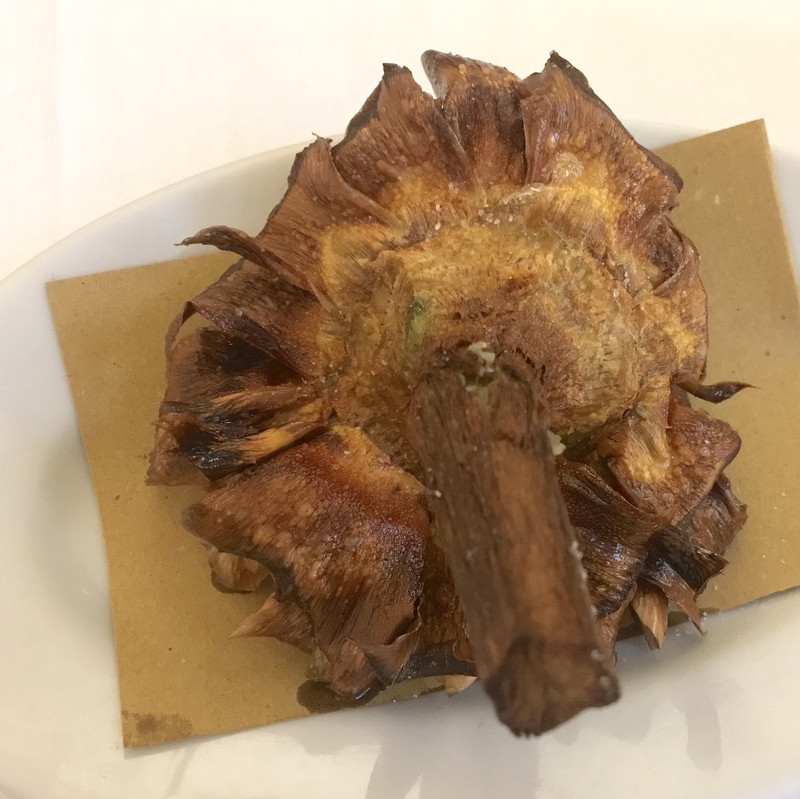 I’m used to my family’s artichokes, which are marinated in oil and herbs (and are very good), so a deep fried one was very different – and so, so good. The petals were like salty little artichoke chips, and the heart was still soft and sweet underneath all that crunchiness. Perfect starter, clearly, because every other table in the room had one, too. Then came the pasta – the tonnarelli (like fat spaghetti) cacio e pepe did not disappoint. Perfectly al dente pasta smothered in cheese and pepper is a thing of beauty. Husband said it was the best bowl of pasta he’s ever eaten. Again, a clear winner, because every table seemed to have at least one bowl of this. The other bowl of pasta I chose was rigatoni carbonara. This is one of my favourite meals, but I don’t order it at home, because most restaurants don’t know how to make it. Contrary to popular belief, carbonara is not made with cream; it’s made with eggs. So when restaurants make it with cream and call it “authentic Italian,” it makes my blood boil. But here, they make it right, with eggs. And guanciale (cured pork jowl, one of my favourite meaty things). And more cheese. And let me tell you, even though it may not look like much, that was the best bowl of pasta I’ve ever eaten (sorry, Nonna). We washed it all down with what was left of the bottle of wine, used the contents of the complimentary bread basket to mop up what was left of the sauces, rolled out the front door and continued to talk about lunch for the next three days. If you’re only going to eat pasta at once place in Rome, make sure it’s at Flavio’s. And that’s coming from an Italian.